The mysterious rise of a landmass from the sea along the coast of Hokkaido, Japan, was caused by a local landslide, an on-site study has found. The mass measures up to 300 meters long, 40 meters wide and rises about 10 meters above sea level. A local woman who was harvesting seaweed along the shoreline Friday morning noticed the area was more elevated than usual. By the time she finished harvesting, the area had risen further. Dutchsinse.com, reporting on earth changes news, weather modification, earthquakes and volcanoes, said on Saturday that "major global earthquake activity is taking place, and serious crustal movement is obviously underway in the region around North Japan." 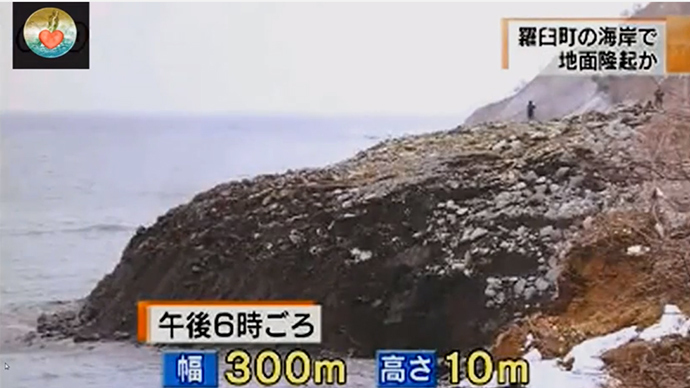 Hokkaido researchers discovered that part of a hill facing the sea had collapsed, the Asahi Shimbun reported. A road along the hill located about 150 meters from the coastline has tumbled in a section stretching up to 30 meters. According to Shintaro Yamasaki, assistant professor of engineering technology at the Kitami Institute of Technology in Hokkaido, a landslide occurred on the hill toward the sea. He said that the landslide pushed up the seabed, so the sea bottom eventually appeared above the surface.